My husband hates fish. Sometimes I am nice and organise an alternative protein for him, like steak. Sometimes I ignore the fact that he doesn’t like fish and cook it anyway as both girls and I love it! This burger would work fine with a steak if you have a non-fish eater in the house, I would just use some relish or mustard to top it rather than tartare sauce. 1. Turn the oven to 200 C fanbake and put an oven dish in to heat. 2. While the oven is warming place the chopped cabbage in a bowl, sprinkle with the sugar and salt and toss through. Stand to the side. The sugar and salt helps the cabbage soften and wilt slightly. If you don’t want to add these, just skip this stage. 3. Once the oven is heated add 2 T oil to the oven tray and leave to warm for about 3 – 4 minutes. Add the kumara chips. Toss these every 10 mins until golden and crispy, they will take about 25 mins total. 4. While the kumara chips are cooking prepare the fish. 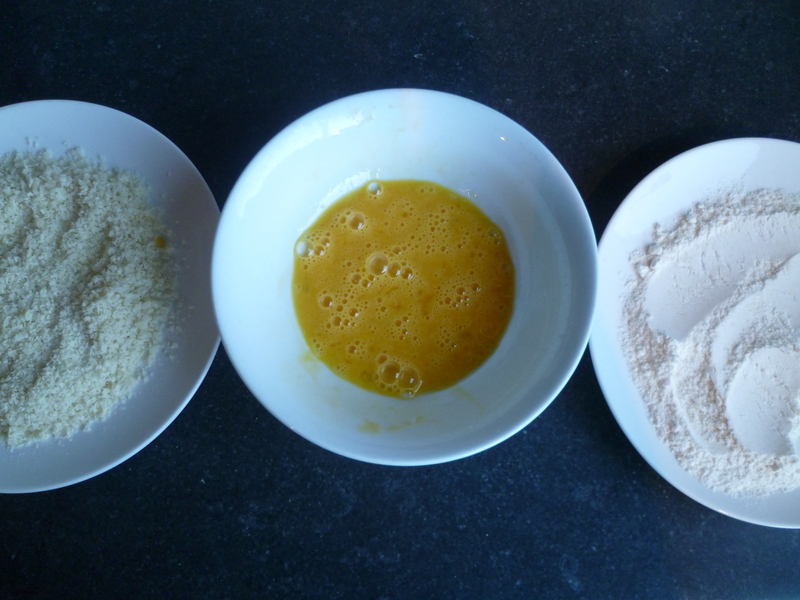 Set up your 3 plates for coating – flour, then egg, then breadcrumbs. 5. Chop the fish fillets in half – I used the smaller sides for the girls and the larger sides for the adults. Heat the frying pan on medium heat. 6. Coat each fish fillet thoroughly in flour, then egg, then breadcrumbs. Add 1 T oil to the pan and heat. Fry on both sides until golden and cooked through. I coat the fattest fillets first and place them in the pan as they take longer than the little skinny ones. 7. While the fish is cooking finish the coleslaw by adding all other ingredients to the bowl and tossing well to coat in mayonnaise. You will need 2 – 3 T mayonnaise depending on the size of the cabbage. 8. Put the baps in the bottom of the oven for about 3 mins to warm under the oven dish – you don’t want them going too crispy. 9. Construct the burgers: Place salad greens on the bottom of the burger bun, top with a fillet of fish (you may need to chop it in half to fit) and top with tartare sauce. 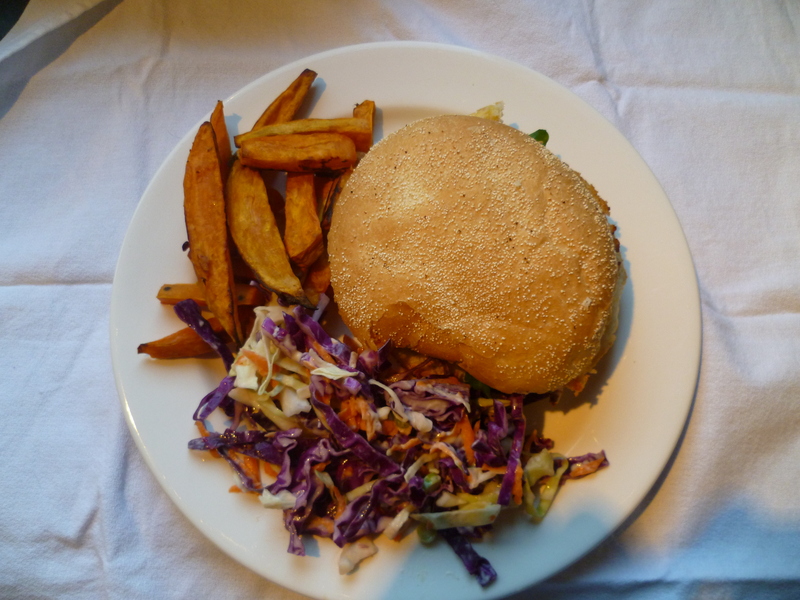 Serve with kumara chips and coleslaw on the side. Hint: If you have little people whose hands struggle to hold a burger you can serve them a deconstructed burger – half the bun and the fish separately. Miss 4 is only just starting to be able to eat a burger without losing the contents out the bottom!